These spaces are the perfect mix of vintage, modern, and cool. Courtesy of Swoon The Studio. There are a few people who put a certain je ne sais quoi to every space they touch that makes you at once insanely jealous and reverent of their style. 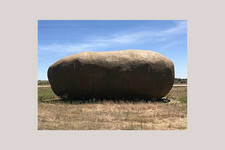 Joslyn Taylor is one of these gems. 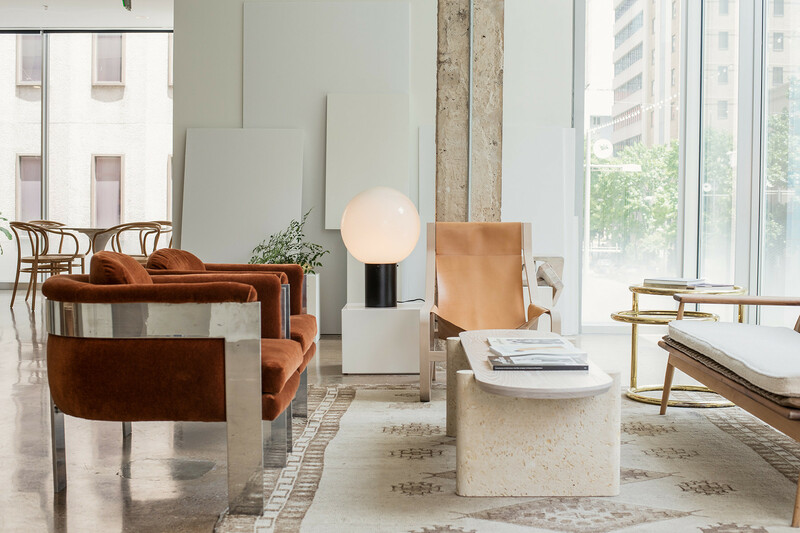 She puts this talent to work as the principal of interiors at the Dallas-based design firm Swoon The Studio, which she runs with Swoon’s founder and principal creative director Samantha Reitmayer Sano. 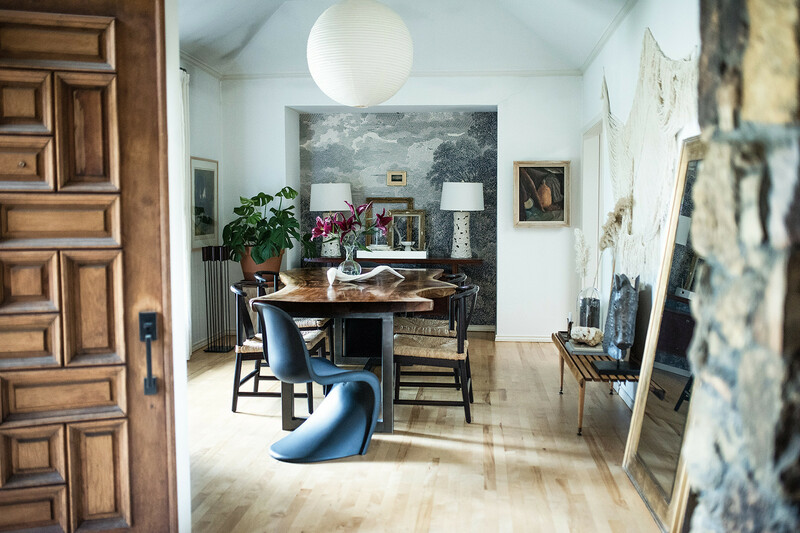 While Swoon curates gorgeous rooms for both residential and commercial clients, two of Taylor's most beautiful projects are also her most personal. 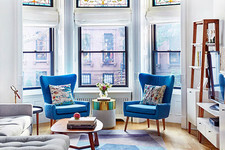 If you take a look inside both her home and office, each possess a truly distinct vibe that feels at once elevated and down-to-earth. 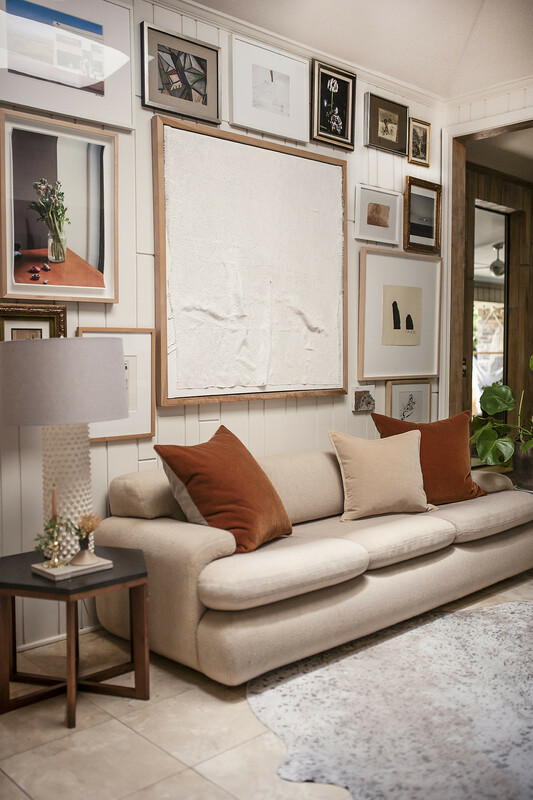 While Swoon's space takes on a more modern feel, the designer's house has an eclectic vibe that's warmed up with unique natural architecture elements. We asked Taylor to share her inspiration behind each of the spaces and give us further insight into her amazing design eye. Lonny: How would you define your personal style? Joslyn Taylor: Organic meets classic. 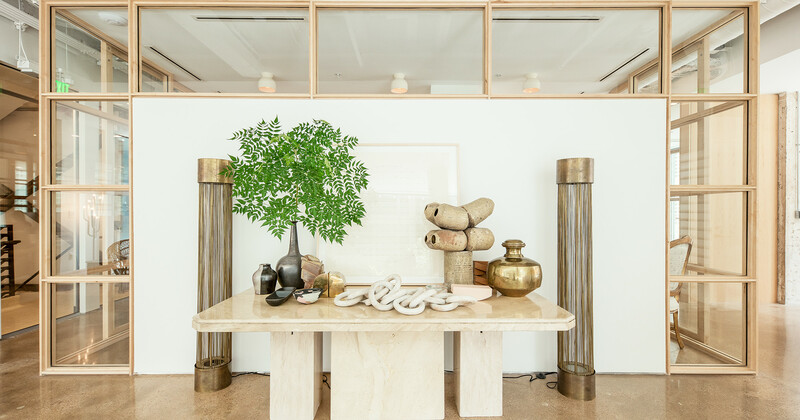 I always gravitate toward natural, tactile materials and objects with a bit of personality and imperfection like honed stone, unfinished wood, aged brass cane, rope, and linen. I want things to feel special, soulful, and cozy, with an artful, handcrafted vibe. But I also appreciate classic design with a sculptural clean-lined feel. My dream piece of furniture is a Carlo Scarpa travertine “Argo” table. 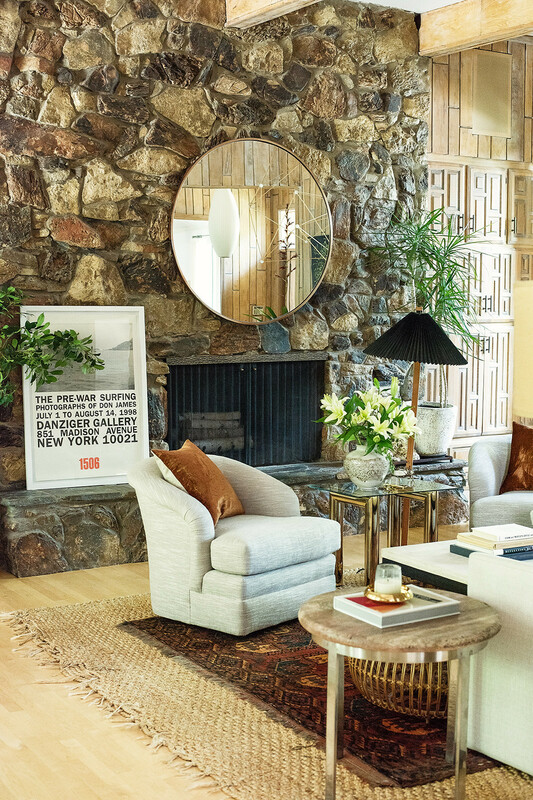 Its blend of classic lines, '70s modernism, and stone hits right in my aesthetic sweet spot. How did your childhood growing up with a traveling musician influence your style? Can you chat a bit about the architecture of your home? 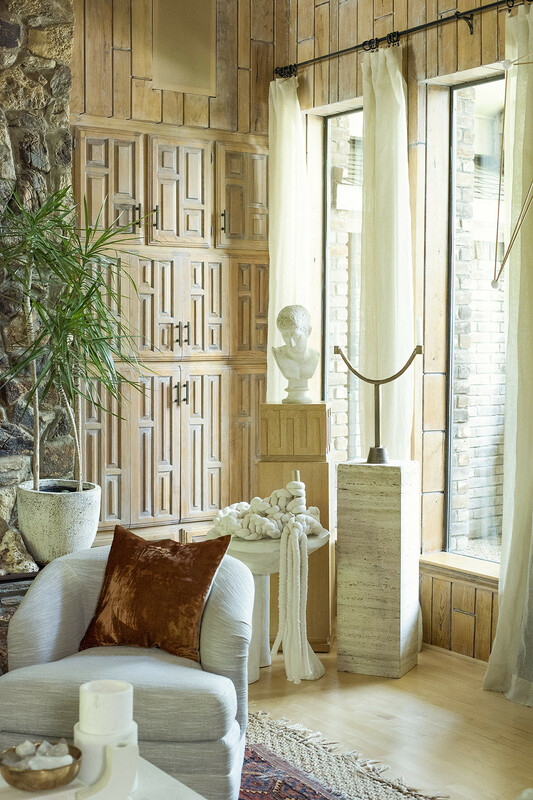 Did you add all the natural surfaces like the wood paneling and stone yourself or was it part of your home when you bought it? JT: Our house was built in 1978. The builder’s son was studying to be an architect, so I think he tried out all his tricks in our house. There are a lot of interesting details and odd corners — every single room in the house has a different ceiling. Let’s just say, it has a lot of character. The stone columns and fireplace were part of the house originally. The wood paneling in the living room is also original, though when we moved in it was stained a dark brown, so we stripped it all to give it a lighter feel. We put in wood or travertine floors throughout the house — it was originally all carpet or vinyl flooring — and then painted most of the rooms Benjamin Moore Decorator’s White to give it an open airy feeling. The bright white paint is the perfect foil to all the stone and wood. JT: I really love our living room. I’m a sucker for all that wood and stone. The room manages at once to feel kind of grand with the tall ceilings and the windows but cozy and warm. Where do you like to go to find unique vintage pieces and art for your space? JT: I look everywhere — vintage stores, thrift shops, 1st Dibs, estate sales. Sam and I make a pilgrimage to Round Top Antique Fair every spring, and I’ve found some great things there over the years. Dallas also has great vintage shopping. I’ve gotten some amazing pieces at Sputnik Modern and Again and Again. Our art is a mix of pieces by friends, things we’ve made as a family, vintage pieces, and some really special gifts. Do you have any tips for mixing vintage and modern pieces together in one arrangement? JT: I think mixing vintage and new is the key to creating a space that feels collected, timeless, and not too “one note.” I hate the idea of walking into a room and being able to instantly identify where every piece is from. Every space needs some “push pull” and a sense of mystery. I don’t hew to design “rules” per say other than keep things balanced — if you think things are feeling a little slick or flat you probably need to add in more vintage, maybe something a little crusty. Similarly, if you’re starting to get a flea market vibe, consider mixing in something clean-lined and iconic like a Pantone chair or a Parson’s table. The design of your office and your home both feel modern yet take very different approaches. What inspired the aesthetics for each of the spaces? JT: Well my house is purely personal. My husband and two daughters are my biggest inspiration when I’m thinking about the aesthetics of that space. We love having friends over for dinner, to play music, and hang out. I want to be surrounded by all the things I love, but I want it to be a place where my family and friends feel comfortable and happy and inspired. I want our house to be the one that everyone wants to come to. 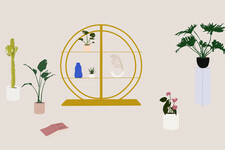 When we were designing the studio, Sam (Swoon’s founder, principal creative director, my best friend, and partner in crime) and I wanted to create a space that would bring out the very best in everyone at the studio. It needed to be functional, but it was also super important to us that it was inspiring. We were really lucky that we got to design the space from scratch, so we had an opportunity to live out some of our design dreams. What was your goal for styling the office space? JT: We have a mix of designers, artists, writers, and project managers at the studio. Everyone is amazing. We wanted them to be able to come to work every day and be in the type of environment that we hope to create for our clients. Sam and I are both passionate about beautiful, interesting objects, and we love styling. So we just let that play out in the office. Did you attempt to organize each room to inspire creativity and collaboration? JT: We spent a lot of time thinking about how to lay out the office so there was space for collaborative work and for people to have some privacy when they need it. To that end, we created a sort of “racetrack” with offices and meeting spaces around two large center work areas where the interiors and branding teams sit. We kept everything really open with a system of custom wood and glass sliding doors that let you close off the workspaces and offices as needed to control sound but keep the view open and let lots of natural light in. We also carved out niches with tables where smaller groups can meet to collaborate as well as a larger conference room-like space where we do bigger client presentations. We were careful to keep things feeling less office-like by using residential furnishings whenever possible. 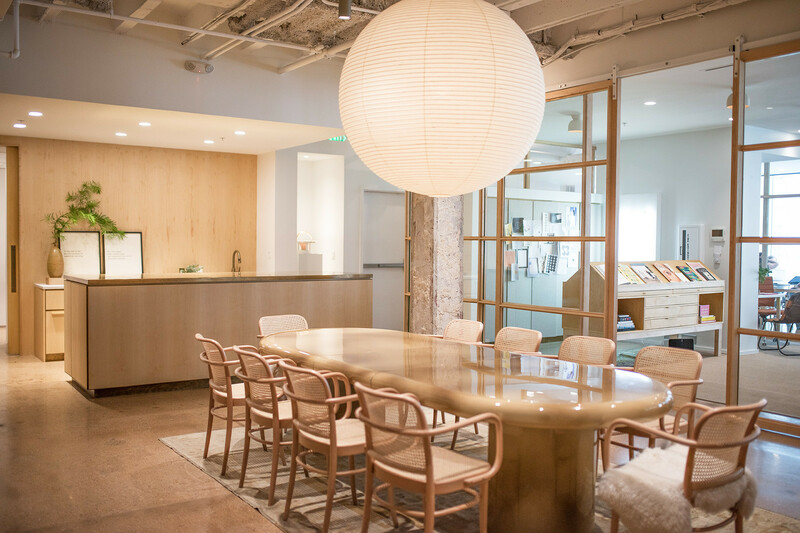 For example, our conference table is actually a huge Karl Springer dining table from 1st Dibs with a massive Noguchi light hanging over it, and we put a mix of Thonet Era chairs and Josef Hoffman side chairs in all our meeting spaces. What are your favorite elements of the office? JT: We really love the way the wood and glass sliding wall system turned out. It’s beautiful and functional, which is always the ultimate goal. I’m a sucker for a good old-school mood board, so I really love the linen-covered Homasote boards that we put on the front of all our cabinets where we can pin up inspiration and projects in process. But our favorite element might be the special pieces of art. Sam has been incredibly thoughtful about creating a meaningful art collection for the studio. She’s pulled together a really cool mix of emerging local artists and pieces that we’ve both admired for a while. The end result is a celebration of all the things we love most, in a space filled with people we adore, doing rewarding, creative work. It’s pretty magical.